The domain within your query sequence starts at position 79 and ends at position 128; the E-value for the WAP domain shown below is 1.96e-21. The four-disulfide core (4-DSC) or WAP domain comprises eight cysteine residues involved in disulfide bonds in a conserved arrangement [(PUBMED:6896234)]. The four disulphide core containing Whey Acidic Proteins (WAP) are the major whey proteins in the milk of many mammals and are considered to be the prototypic members of the family. 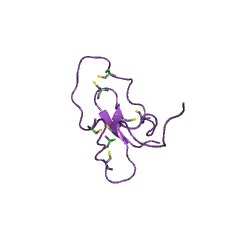 However the WAP domain is not exclusive to WAP proteins, but it is found in many other proteins, a number of which have been shown to exhibit antiproteinase function [(PUBMED:11965550)]. 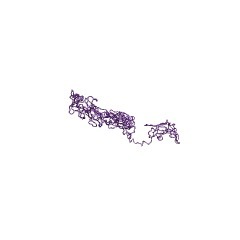 One or more of the WAP domains occur in the WDNM1 protein, which is involved in the metastatic potential of adenocarcinomas in rats [(PUBMED:3136918)]; Kallmann syndrome protein [(PUBMED:1913827)]; caltrin-like protein II from guinea pig [(PUBMED:2324101)], which inhibits calcium transport into spermatozoa; elafin, a serine elastase inhibitor which belongs to MEROPS inhibitor family I17 [(PUBMED:2394696)]; and papilin, a metalloendopeptidase inhibitor which belongs to MEROPS inhibitor family I2 and is effective against procollagen N-proteinase [(PUBMED:11076767)]. There are 12683 WAP domains in 7717 proteins in SMART's nrdb database. Taxonomic distribution of proteins containing WAP domain. This tree includes only several representative species. The complete taxonomic breakdown of all proteins with WAP domain is also avaliable. Click on the protein counts, or double click on taxonomic names to display all proteins containing WAP domain in the selected taxonomic class. The candidate gene for the X-linked Kallmann syndrome encodes a protein related to adhesion molecules. Kallmann syndrome associates hypogonadotropic hypogonadism and anosmia and is probably due to a defect in the embryonic migration of olfactory and GnRH-synthesizing neurons. The Kallmann gene had been localized to Xp22.3. In this study 67 kb of genomic DNA, corresponding to a deletion interval containing at least part of the Kallmann gene, were sequenced. Two candidate exons, identified by multiparameter computer programs, were found in a cDNA encoding a protein of 679 amino acids. This candidate gene (ADMLX) is interrupted in its 3' coding region in the Kallmann patient, in which the proximal end of the KAL deletion interval was previously defined. A 5' end deletion was detected in another Kallmann patient. The predicted protein sequence shows homologies with the fibronectin type III repeat. ADMLX thus encodes a putative adhesion molecule, consistent with the defect of embryonic neuronal migration. Four disulfide bonds' allocation of Na+, K(+)-ATPase inhibitor (SPAI). We have recently reported the primary structures of the three unique peptide inhibitors (SPAI-1, -2, and -3) against Na+, K(+)-ATPase which contained four disulfide bridges in common (Biochem. Biophys. Res. Commun. 164, 496 (1989)). The disulfide connectivities of SPAI were determined by the combination of amino acid analyses with the direct application to a gas-phase sequencer of its proteolytic fragments. The disulfide bond was identified by detection of phenylthiohydantoin derivatives of cystine and its decomposed product dehydroalanine. The four cysteine pairs were disclosed to be Cys20 to Cys49, Cys27 to Cys53, Cys36 to Cys48, and Cys42 to Cys57, all linked by disulfide bridge formation. The allocation pattern of these disulfide bonds was the same as that recently reported for human mucous proteinase inhibitor (EMBO J. 7, 345 (1988], though SPAI showed no proteinase inhibitory activity at all. Purification and structure of caltrin-like proteins from seminal vesicle of the guinea pig. Two different small proteins that cross-react with the antiserum against bovine caltrin (calcium transport inhibitor) have been purified from the seminal vesicle contents of the guinea pig. The primary structure and some molecular characteristics of the pure proteins are reported. The two proteins interact with concanavalin A indicating the presence of carbohydrates in their molecules. Chemical deglycosylation with trifluoromethanesulfonic acid, after reduction and carboxymethylation, results in complete loss of affinity for the lectin. Removal of sugar components from the structure destroys the ability of caltrin-like proteins to react with antibodies to bovine caltrin. The protein moving faster on polyacrylamide gel electrophoresis is designated guinea pig caltrin I, the other is II. They contain 45 and 55 amino acids, and the molecular weights of the peptide portions are 5082 and 6255, respectively. Although they have entirely different amino acid sequences, they share some common features: recognition by rabbit antibodies to bovine caltrin, the predominance of basic residues and the presence of 3 cysteine residues in fraction I and 8 in fraction II. The proteins have pI values of 9.5 and 10.2, respectively, which are consistent with the amino acid composition. The two pure fractions are approximately equally effective, on a weight basis, as inhibitors of 45Ca2+ uptake by guinea pig spermatozoa. The data presented reinforce the hypothesis that caltrin-like proteins are responsible for the previously reported (Coronel, C.E., San Agustin, J., and Lardy, H.A. (1988) Biol. Reprod. 38, 713-722), calcium-transport inhibitor activity detected in reproductive tract fluid from adult male guinea pigs. 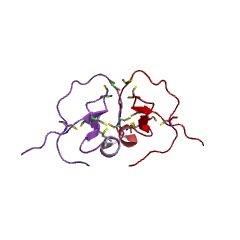 A potent inhibitor of human leukocyte elastase (EC 3.4.21.37) and porcine pancreatic elastase (EC 3.4.21.36) was purified to homogeneity from human horny layers. It inhibits human leukocyte elastase and porcine pancreatic elastase in a 1:1 molar ratio and shows equilibrium dissociation constants of 6 x 10(-10) M and 1 x 10(-9) M, respectively. Inhibition of plasmin, trypsin, alpha-chymotrypsin, and cathepsin G was not observed. This inhibitor proved to be an acid stable basic peptide with an isoelectric point of 9.7. 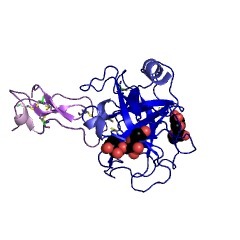 The complete amino acid sequence appears to be unique with 38% homology to the C-terminal half of antileukoprotease. 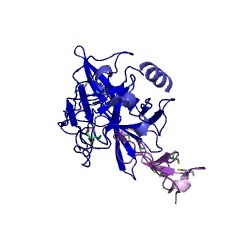 The sequence shows that the inhibitor is composed of 57 amino acids and predicts a Mr of 7017. The high affinity as well as the apparent specificity for elastases suggests a functional role in preventing elastase-mediated tissue proteolysis. It is suggested that the term "elafin" be used to designate this inhibitor. Differential expression of a novel gene, WDNM1, in nonmetastatic rat mammary adenocarcinoma cells. Subtractive hybridization was used to investigate differences in gene expression between a metastatic clone and nonmetastatic clone of the rat mammary adenocarcinoma line DMBA-8 which differ 100-fold in their metastatic behavior. Several differentially expressed highly homologous mRNAs (600 to 900 base pairs) were identified from the nonmetastatic line which are expressed at a level 20-fold higher than in the metastatic clone. Available sequence data show no homology to published gene sequences. There is no difference between the metastatic and nonmetastatic clones regarding DNA restriction fragment sizes or copy number of the gene. Expression of this newly described gene, named WDNM1, may be an important correlate of nonmetastasis in this tumor model. 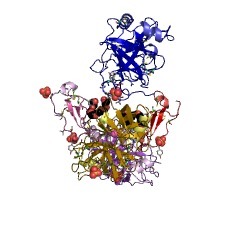 Mouse whey acidic protein is a novel member of the family of 'four-disulfide core' proteins. Unlike in other mammalian species, the major whey protein in mouse is not alpha-lactalbumin, but a cysteine rich, acidic protein with a molecular weight of 14.0 kDa. We have deduced the amino acid sequence of this mouse acidic of whey protein from the nucleotide sequence of cloned cDNA. 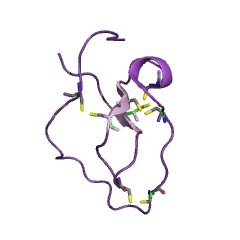 The positions of the half cysteines suggest that mouse whey acidic protein (WAP) is a two domain protein, very similar in structure to the plant lectin wheat germ agglutinin and the hypothalamic carrier protein neurophysin.